Credit: By derekGavey on Flickr. Some rights reserved. 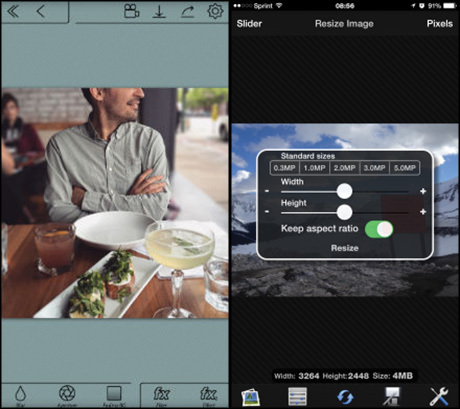 There are tons of apps available to help you get professional-looking photos from your iPhone and streamline the process for shooting, editing and uploading. But with so many available, how do you know which ones to go for? 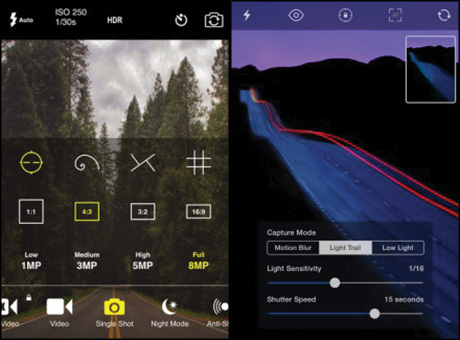 Below is our pick of the App Store, from applications that mimic DSLR capabilities for manual focus and shutter speed, to producing panoramic and interactive images. We've focused on iOS apps, although many are also available on Android so check the Google Play store if that applies to you. Whatever app you're using, always keep the camera steady and give the lens a quick wipe before taking a photo to remove any dirt, dust or grease. And remember, practice makes perfect! Part camera app, part social network, VSCO Cam offers a way to shoot, edit and share photographs both on social networks and with other users. Advanced camera options such as manual focus, ISO and shutter speed are comprehensive enough to satisfy experienced photographers. Meanwhile, a copy-and-paste function to apply a stack of edits to multiple images at once offers a simplified batch editing process. Once you're done editing photos, you can choose to share them to the VSCO Grid, where they are available to browse by the rest of the app's community. The standard app is free, with additional filter packs available from £1.49 or $1.99 in the US. The go-to app for many iPhoneographers, Camera+ is a treasure trove of pro photography features including a stabilizer for super-sharp shots and the ability to set exposure independently of focus. Photos are saved to a 'lightbox', which means you can snap away as much as you like and add only the best shots to your Camera Roll. Save this £2.29 ($2.99) app to your iPhone home screen for easy access. A photo and video editor, ProCam 2 has a handy night mode for taking photos in low light, as well as a self-timer, burst mode and anti-shake mechanism. You can also shoot HD video in this £2.49 ($2.99) app, as well as time lapse and slow motion footage. modes as well as a self-timer, exposure lock, and time lapse function. From mountain peaks to architectural delights, the £2.29 ($2.99) app 360 Panorama makes it easy to capture 360˚ photos to save that breathtaking view for a rainy day. For the best results, stand in an open space and hold your phone vertically, then rotate in a full circle with your arms close to your body for extra stability. It might look a bit strange, but the results will be worth it. Google's Photo Sphere does a similar thing for free, although with the catch that in order to share your panoramas publicly you have to publish them to Google Maps. 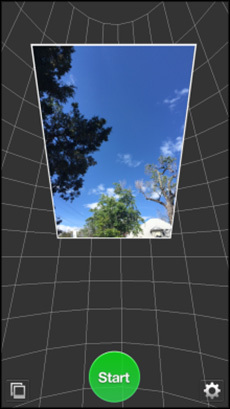 Take your panoramic shots to the next level with Fyuse, a free app which captures interactive "spatial photographs" showing a subject from all angles. As well as sharing options for Twitter and Facebook, Fyuse also has its own network where you can view, like or comment on other users' videos. 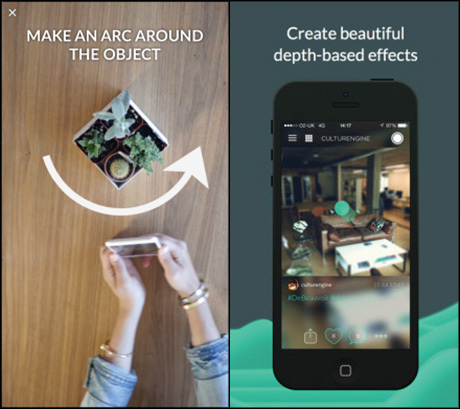 Produce 3D photos, videos and GIFs with Seene, a free app which blends image, depth and movement. There are various filters to enhance your shots and the app also integrates with Google Cardboard, so you can view your 3D creations in virtual reality. Once in danger of becoming a bit stale, Snapseed is once again a must-have photo editing app following a major update this year. Among the new features is a 'spot repair' function for retouching, as well as a new brush tool enabling users to apply filters only to select parts of an image for a striking effect. Another clever addition to the free app is the 'transform' feature. As you adjust a photo's perspective, this automatically fills in any parts that may become distorted with the appropriate background. Billed as an all-in-one photo editor, Enlight offers an enormous range of Photoshop-worthy editing features, with 17 variations on black-and-white filters alone. Currently on offer in the App Store for 80 percent off the standard price, this £3.99 app (currently on offer in the states for $0.99) also includes corrective features to straighten or repair over-exposed photos. If you like a vintage feel to your photos, there's a function to add two-toned gradients and light-leaks to your images for an authentic retro look. And arty types will appreciate the ability to overlay two photos for a surreal double exposure effect. To throw in a bit of fun, you can draw or doodle on photos using the app, or add custom text, borders and more. There's also a range of different crop sizes, including a square-ready option for Instagram fans. 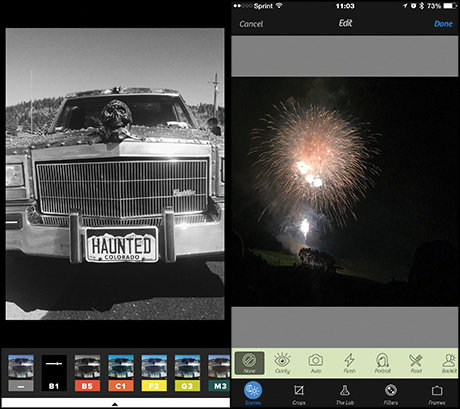 Standard editing functions such as crop and rotate, saturation levels and red-eye removal, make PicShop HD a useful app to have at your disposal. However, what really makes this £3.99 ($4.99) app stand out is its 'Meme Maker', allowing you to turn your photos into pop culture commentary. 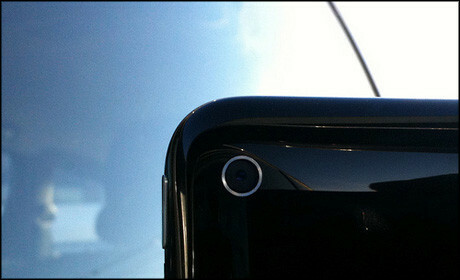 As the name suggests, AfterFocus allows you to adjust the focus of your shots using a background blur effect or filter. Simply draw with your finger over the area you wish to focus and the app will do the rest. Effects include motion blur and Bokeh effect, which appears as out-of-focus light. A quick and easy way to crop photos to a specific size, Resize Image allows you to set custom dimensions or choose from standard sizes. It is handy for optimizing images for Twitter in-stream previews (1024 x 512 pixels), or when submitting images for different publishing formats, such as mobile, web and print. The app is free, or there's an ad-free version for £1.49 ($1.99). Panoramic photos and Instagram are not traditionally a match made in heaven, resulting in a tiny thumbnail with empty borders at top and bottom. However, Instapan turns your panoramic masterpieces into scrolling videos so they can be viewed in full size. 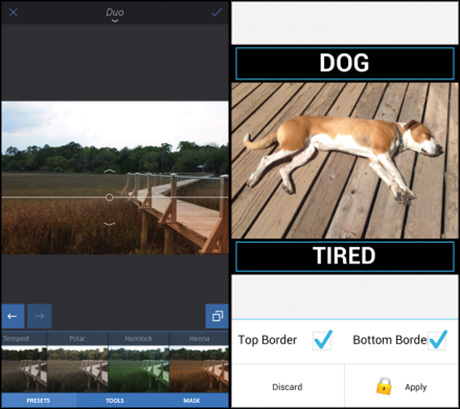 The free app allows you set the speed and direction of your video, although there's a one-off cost of $0.99 to remove the Instapan watermark. 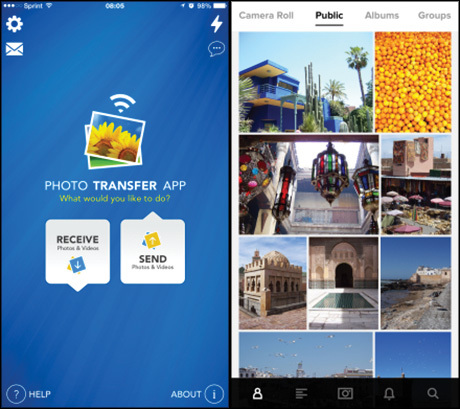 If you're often juggling photos between various devices, Photo Transfer App might just be your saving grace. The £2.49 ($2.99) app allows you to easily upload multiple photos (and videos) from your smartphone to any Windows or Mac computer on the same Wi-Fi network – and vice versa. Plugins for Dropbox, Google Drive and Flickr are also available from $0.99. An oldie but goldie, the free Flickr app comes with 1,000GB of storage space and an option to auto-upload all photos that are added to your Camera Roll. Not only does this mean your photos are safely backed up somewhere other than iCloud (which only offers 5MB of free storage space), it also means you can spring clean your Camera Roll regularly to save space on your device. Auto-uploaded photos are private until you choose to publish them, and you can download full-size original photos from Flickr to your Camera Roll whenever you need them. Do you have any other photography apps that you love? Feel free to leave recommendations for your fellow journalists in the comments below. Crafted storytelling vs raw content: which production style is mobile journalism best suited for?